State leaders traveled to Texas this week to promote a controversial fix for transportation funding. Gov. John Hickenlooper was the keynote speaker at the P3 Conference in Dallas. Denver Mayor Michael Hancock spoke to kick off the conference and about 30 city and state employees attended the public-private partnership event. An example of a P3 is what just happened to U.S. 36 between Denver and Boulder. The Colorado Department of Transportation contracted with a private group to build the highway and add one toll lane in each direction. Plenary Denver manages the lanes and receives the toll lane revenue, but is responsible for the upkeep of the road for 50 years. "A lot of the public pushed back dramatically and said, 'We were locked out, we didn't hear about this,'" said Hickenlooper. "Every one of their elected representatives, their local (leaders), the mayors, everyone else was invited to come to this multiyear sequence of meetings. At the same time their state legislators -- they had been in office for a few years -- they had all been invited, most of them, they hadn't come." It seemed everyone who spoke from Colorado made sure the conference attendees were aware that mistakes were made in the U.S. 36 P3, and educated the group on how they plan to avoid the mistakes this time around. "A quarter of you in this room are engineers, and engineers just aren't that good at PR. No offense," said Hickenlooper. "The one thing we really learned was that you got to keep all the legislators and the local communities in the process. What we're really focused on right now is being transparent. I mean, every stage of the planning process, we want everyone involved in the community -- anyone connected to the community -- we want involved in that process." "Sometimes when we walk into the public officials or the elected officials, we can sound like the infomercial on TV, 'Boy, have I got a deal for you. And if you buy now, with this P3, I'll throw in a set of Ginsu knives," said CDOT High-Performance Transportation Enterprise Director David Spector. "We need to be really proactive in explaining, not to those public officials, but to the folks they represent, what this is. We learned that lesson the hard way." IN-DEPTH: Click here to view the CDOT P3 transparency documents. 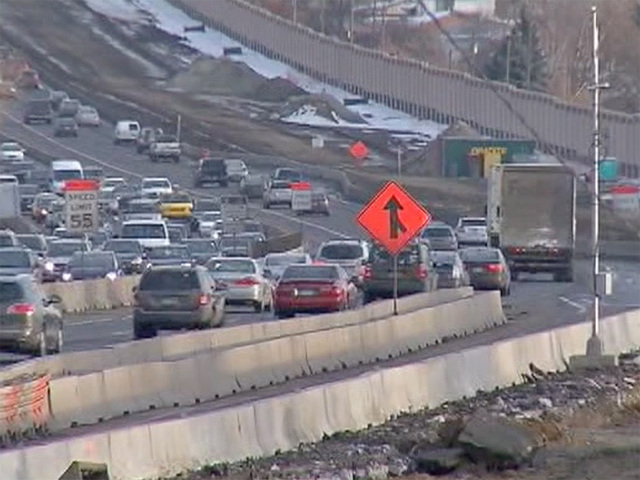 Denver7 also asked about the idea of changing the state's gas tax. Drivers pay 22 cents per gallon for the state's gas tax and 18 cents per gallon for the federal gas tax. "It's tricky, that's a real tricky one," said Hickenlooper. "I'd rather go and keep the same tax, but put in on a percentage, so that when the cost of gasoline comes down, the tax goes down, when the cost of gasoline goes up, the tax goes up," said Hickenlooper. "Most taxes we have are percentages, so a flat tax per gallon seems kind of old fashioned." During the U.S. 36 expansion, the public got angry during meetings with CDOT about feeling left out of the process and not knowing the details of the plan that transferred the highway to private control. "We have adopted an open records analog, specifically for our public-private partnership transactions, where we talk about when we're going to release what documents, at what point during the process," said Spector. "We prepare a plain English summary of what the contract contains, so that when the contract is awarded, people will be able to take that, sort of bullet-pointed summary of what has happened, because you can give them the 200 page document and that's not going to do you any good." He also reassured potential investors that the state still does not reveal every detail. "I don't want people to have misconceptions and freak out potential bidders, we do keep all of the proprietary information confidential and we hold all that back, but what we've been able to do, we'll say, 'Here's when we can release some of that data that would otherwise be protectable by our open records laws,'" said Spector. In his kickoff address, Hancock talked about the different P3 projects in the metro area, including Union Station. "Today, we have almost a six-to-one [return on investment] on this project, with private investment having coming in," said Hancock. "It was an appropriate and responsible way to invest public money, in partnership with the private sector." Hancock referenced last week's U.S. World & News report that ranked Denver as the number one place to live . After learning that, Plenary Group chairman Dale Bonner took some credit. "I didn't know this, but you said the city was designated the number one place to live in America? And I'm sure there's a footnote in there somewhere that says people really like that new toll road that goes between Denver and Boulder. I think that had something to do with it," said Bonner. The conversation at the conference also included why politicians may be turned off by P3s. Colorado lawmakers passed a bill last year to create a new checks and balance system for them to approve large contracts, but the Governor vetoed that bill. "There's a risk involved and if that project goes south for some reason, that can turn into political risk really really quickly, and that political risk turns into an elected official losing their job and getting voted out of office," said Spector. "You have to acknowledge it up front, yes, the private sector is going to make money on this transaction, otherwise they wouldn't be doing it. We're getting a lot more value for our money because we're thinking about it over the course of 50 years instead of just building something and then trying to figure out how we're going to pay for it later on." Lawmakers are considering a bonding bill that would ask voters to approve a loan for $3.5 billion to fund transportation projects. After his keynote speech, Denver7 asked Hickenlooper if it's either P3 or bonding. "I think you need P3 and bonding. I think P3 helps you do it for less money, but it doesn't do the whole thing, it just doesn't," said Hickenlooper. "Having a revenue stream that allows you to bond $4 or $5 billion, is a big part if we're really going to make Colorado Springs all the way to Fort Collins passable, so it's not all the time congested."